If you have been over to Higgins House lately, you might have noticed the hustle and bustle of restoration specialists and the unmistakable gleam emanating from nearly every surface. Higgins House, the Tudor-style mansion at the edge of campus, is in the middle of a restoration to bring back some of the earliest majesty of the circa 1921 house. The restoration is being funded by a generous alumni donation, according to Peter Thomas, executive director of lifetime engagement. He explains that Michael Abrams ’77, a Texas-based member of WPI’s Alumni Association Board of Directors, found phoning in to board meetings challenging. With members calling in from all over the world and relying on the house’s old equipment, hearing speech clearly was difficult and the experience was not engaging. Abrams suggested a donation to upgrade the equipment, and from there the idea, the donation, and the project blossomed into major restoration work. Abrams is a valuable partner in the entire process, says Thomas. “He has been with us every step of the way,” he says. The goal is to have the work complete for the alumni board meeting in April and for a grand opening in May. The donation is the first that can be recalled that is designated especially for Higgins House; it has now piqued interest from other potential donors. restoring Higgins House's original beauty and character. “This house has needed restoration and TLC,” says Gina Patterson, executive assistant with University Advancement. “The people who have used and know the house say this place is awesome.” That includes the various faculty and staff who have worked in the building or who have spent time strolling the gardens. It’s also the alumni who gather here or the handful of students who lived in the house in the 1970s. And it extends in a ripple effect when considering all the weddings, baby and bridal showers, and other celebrations taking place on its grounds. Of the various organizations to have been housed at 1 John Wing Road, current occupants include University Advancement, Advancement Events & Communications, Government and Community Relations, Alumni Office, Student Alumni Society (SAS) office, and the student callers [during telethons]. Higgins House was donated to WPI in 1971, but its history dates to five decades before that time when the home was built by Aldus Chapin Higgins III ’93 (whose father, Milton Prince Higgins, was one of the founders of Norton Company and one of the first two faculty members at WPI) and his wife, Mary (“May”), in a partial replication of the Compton Wynyates Castle in Warwickshire, England. Members of the Higgins family lived in the home until May’s death. It’s listed on the National Register of Historic Places (added in 1980). With the guidance of Nick Palumbo, WPI's facilities project manager, the university hired Old New England Restoration as general contractor, with subcontractors Troy Hardwoods and Iris Lee Marcus & Company rounding out the expertise. The Higgins House library has a new A/V system, which includes a dual projector in the ceiling that displays callers as they speak. In addition to restoration of wood—from the floors and baseboards to decorative elements, work also includes creation of an alumni lounge area; new carpeting, lighting, and seating; WiFi, network, electric, and utility upgrades; cosmetic repairs; and signage repair. 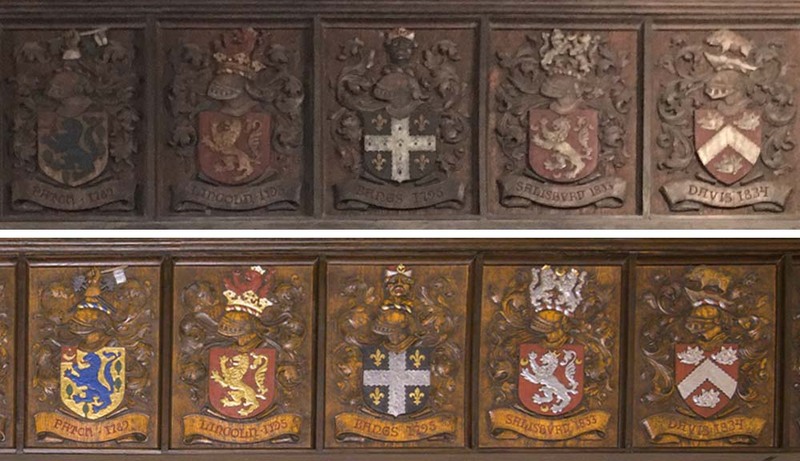 One of the most startling changes is in the coats of arms series above the Great Hall. Each of the plaques represents a family that owned the land Higgins House sits on*. For years, if visitors were lucky enough to even notice they were there, they were almost never able to read the names on the plaques because of the century-old thick layer of grime covering them. Thomas is thrilled with the result. “When Iris was doing the restoration work, you could smell the cigar smoke in the water from the cleaning,” he says. And you could also finally read the names on each plaque. The restoration is returning a sense of majesty to the house. Everyone admires it.